Sweet and almost movie horror green, the Grasshopper is one of the first cocktails many folks try. Why? Because it tastes like a chocolate mint. 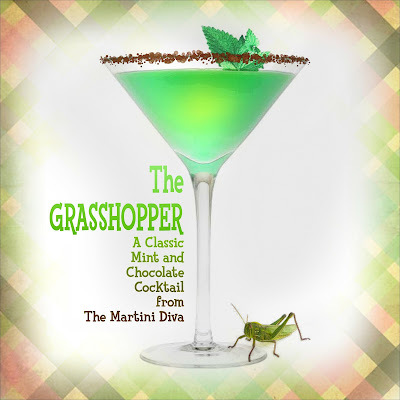 Hugely popular in the late fifties and early sixties, the Grasshopper is said to be the brainchild of Philip Guichet at his restaurant Tujague's (a landmark bar in the French Quarter of New Orleans, Louisiana), created for a cocktail competition sometime around 1919. A decidedly sweet dessert style drink, the Grasshopper deserves a comeback, if only for the fun of its almost neon color. Besides, there's nothing wrong with trading that after dinner mint in for a fun, vintage after dinner chocolate mint cocktail occasionally. Tujague's still serves Grasshoppers, though now with a float of brandy on top. If you're ever in New Orleans you should stop in and order one. I went another route with a few drops of Scrappy's Chocolate Bitters to help cut through the deadly sweetness and reinforce the chocolate a bit. DIRECTIONS: Chop the cacao nibs in the food processor or blender. Fill one plate with the 2 tablespoons of green crème de menthe and the other with the crushed cacao nibs then dip the rim of your glass into the liqueur then roll glass rim in the cacao nibs. Chill the glass in the freezer. Fill your cocktail shaker with ice, add the green crème de menthe, the white crème de cacao and the half and half. Shake until chilled then strain into the chilled glass then tap on a few drops of chocolate bitters. Float the chocolate mint sprig on top and enjoy! Note: Some folks use ice cream in place of the half & half. I find this puts the cocktail way over the sweetness top and it is not what the original recipe calls for. National Grasshopper Day is September 15th.